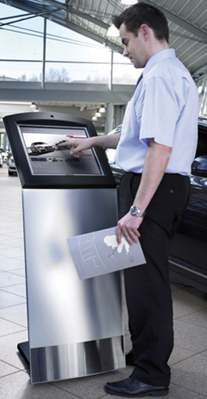 The basic idea behind the information kiosk (booth) or Touch screen Kiosk is Public Information System. Public Information Systems – Information kiosks are used by many people that have little or no computing experience. The user- friendly touch screen interface can be less scary and easier to use than other input devices, especially for novice users, making information accessible to the widest possible audience. ULTIMATE ITPL has been engaged by government The information kiosk (booth) is the best and most effective way to convey the information about the organization and its activities to common people. Thus increasing transparency in work and reducing tedious and lengthy work processes. All the information about the organization and its departments can be easily displayed in for the use of common people. We at ULTIMATE ITPL can develop the application in regional language so the large no of people can understand and use the Public Information System. Touch screen kiosk - The touch screen is one of the easiest to use and most intuitive of all PC interfaces, making it the interface of choice for a wide variety of applications. The user can operate the PC without the use of Keyboard and mouse just by touching the screen and use the application developed. We at ULTIMATE ITPL develop informative & interactive touch screen applications for public use as well as internal use by employees to retrieve the required information. We have deployed touch screen kiosk booths for many of the government organizations for sharing their organizational and departmental information for common public.